How to Cook Kerak Telor Jakarta - Indonesia has many culinary tradition provides its traditional food. Betawi, also born in Jakarta called, has a lot of popular dishes such as Ketoprak, Gado Jado-, egg shells, Soto Betawi, Uduk Rice, Nasi Ulam, and much more. Kerak telor jakarta is traditional flavored omelet food in traditional Indonesian cuisine. 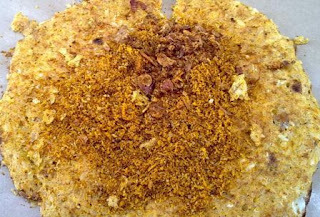 Kerak telor Jakarta is made from glutinous rice with eggs cooked and served with the toping of serundeng or fried grated coconut, fried onions and dried shrimp. The kerak telor Jakarta usually serve as the snack rather than a main course. The vendors of Kerak telor has also become a must-have menu items for people that visit in the annual Jakarta fair. There are 2 kinds of Serundeng , wet and dry Serundeng Serundeng. Some spices such as salt, pepper and spices. In Jakarta streets, it costs about Rp13,000 the chicken Kerak telor and Rp15.000.00 for duck eggs.The Kerak telor Jakarta was possibly named after a little charred is said to have been jakarta was called Batavia Jakarta. There are a lot of coconut trees in Batavia that people use for different purposes. One is to get rid of meat mixed with boiled rice, eggs and a few spices then cooked in a way that sweets called white crust. This article will give you the information about how to make the delicious Kerak Telor Jakarta. Heat the pan until hot enough of the kerak telor. Put a tablespoon of vegetable sticky rice that has been soaked with water, cover and cook for 2-3 minutes. Open the cover, then place 1 egg, 1 tablespoon of fried onions, 1 tbsp serundeng, 1/2 tablespoon dried shrimp, 1 piece of cayenne pepper, 1 teaspoon salt, 1/2 teaspoon pepper and a teaspoon of sugar and stir it well. Behind fried kerak telor and flames licked the top surface burn fragrant. Your delicious Kerak Telor is ready to serve. That’s all the recipe and steps to cook Kerak Telor Jakarta.